in Bengali recipe, Festive recipe, Healthy recipes, Veg. Our star of today's recipe is Patol or pointed gourd, a summer vegetable available from the month of April or May till October in India. No other cuisines other than Bengali Cuisine uses so much of this vegetable in India. It is a beloved vegetable in Bengali households, hence cooked in numerous ways. Just make a fry of it, a simple curry dish or add it in a fish curry, it brings deliciousness immediately. It is one of my favorite vegetable and I cook it very often in my household. It reduces fever and stimulates liver. It has cooling effect on body. It purifies the blood. Due to which it is effective in treatment of diseases of skin. Eating parwal reduces excess cough and acidity in body. Therefore, I consume this vegetable very often, almost daily and if you didn't yet, try it, you'll love it. Here are some ways I make it, all from Bengali Cuisine : Aloo Poatoler Dalna(Potato and Parwal in a simple curry dish), Narkel sorshe Patol(Parwal cooked with mustard paste and fresh coconut), Narkel Patol Charchari(Parwal cooked with mustard paste), Patol Posto(Parwal cooked with poppy seed) and most popular Patoler Dolma(Stuffed pointed gourd cooked in onion-tomato gravy, non-veg version). Today I'll post the Vegetarian version of the famous Patoler Dolma. 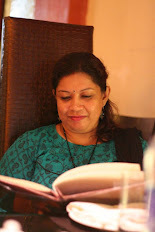 We, bengalis even though love our fish and meat, we also eat vegetables a lot and there are some days when we eat only vegetables and on festive days when using onion and garlic also not allowed, those days this type of no onion-no garlic recipes are made. 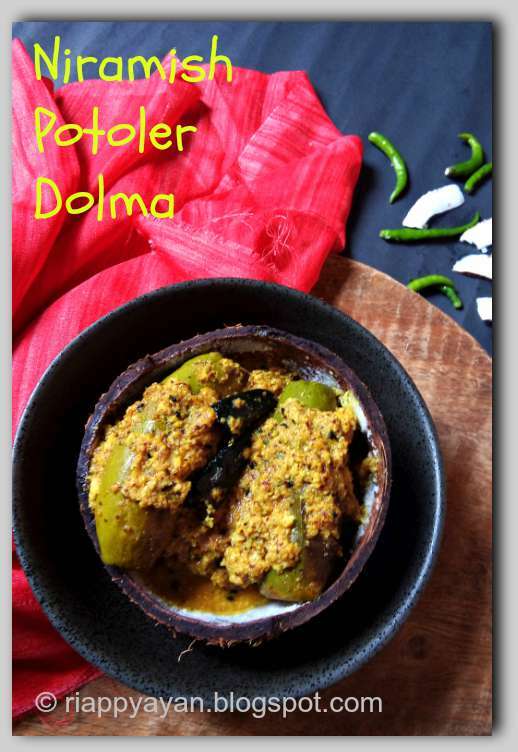 Patoler Dorma/Dolma is nothing but stuffed Parwal, cooked in a yoghurt and mustard paste gravy. This recipe is a bit time consuming, but after you taste it you'll know it's all worth it. You need to take longer parwals/patols for this recipe. 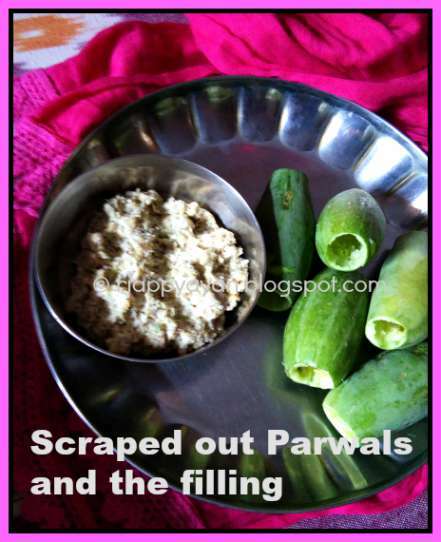 Seeds of parwals are first scraped out, then each parwals are stuffed with stuffing and then shallow fried. Fried parwals are then cooked in a yogurt and mustard paste gravy with fresh coconut added for taste. Poppy seed : 3 tblsp. Wash the pointed gourd(patol) very well. Pat them dry. Do not peel the skin of patol, with a knife scrape the green skin lightly. Cut a small part from each ends. Now with the back of the a spoon, scrape out the inner soft core from one side. Keep the other side sealed. Rub little salt to the pointed gourds and keep aside. 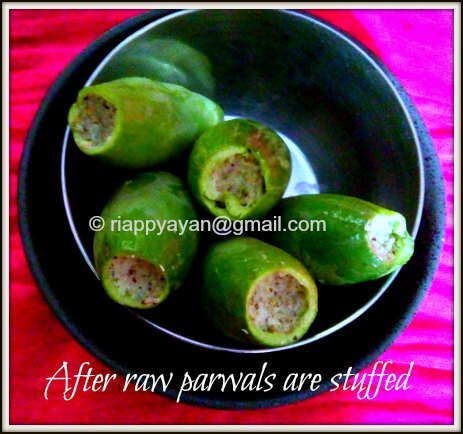 Stuffing Parwal/patol : Make a smooth paste of freshly grated coconut, poppy seed, green chilies, inside core of parwal/patol, salt and sugar. Add very little water while making the paste, only few teaspoons. Your stuffing is ready. Stuff the pointed gourd from the end that is open with the coconut stuffing. Do not over stuff. 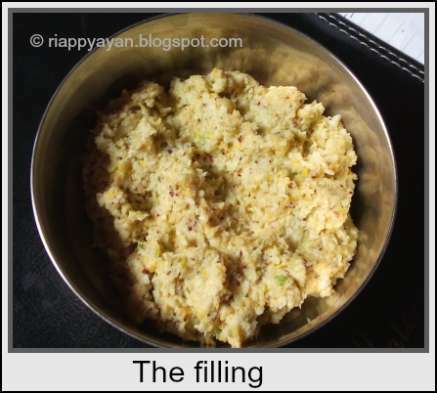 Leave a little space, otherwise stuffing will come out while frying. In a bowl beat the yogurt and keep aside. Make a paste of coconut, poppy seed, black mustard, green chilies. In a pan heat little oil, fry the stuffed pointed gourd till nicely browned. Keep aside. In another fresh pan heat rest of the oil, when the oil is hot add onion seeds and dry red chilies. As the seeds splutter, lower the heat and add the beaten yogurt and the paste made for the gravy, cook for 5-6 mins. or till oil separates. Add turmeric powder, red chili powder, salt, sugar, mix well. 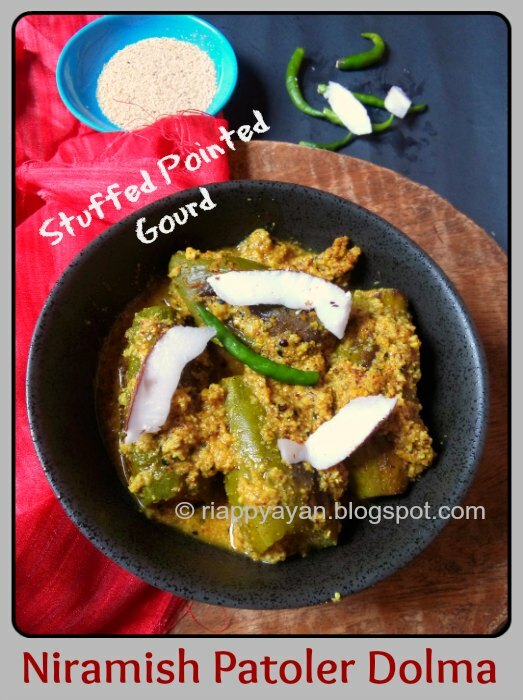 Add the fried stuffed pointed gourd, add 1/2 cup warm water, let it boil, cover and cook for 5-6 mins. Switch off the heat when gravy thickens and parwals are cooked through. 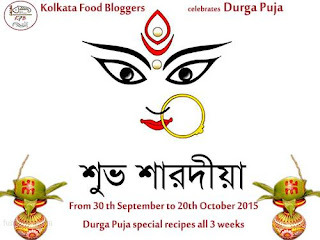 Labels: Bengali recipe, Festive recipe, Healthy recipes, Veg. a delicious looking sabji. Love parwals. Unfortunately we don't get them here in Mombasa.